Back in the summer term, the Rainbows did a spot of “camping”. In the garden behind our meeting hall, we toasted marshmallows over tealights. This only just worked – it was hard to keep the little candles lit in the breeze, and their flames were barely strong enough to toast a marshmallow unless the Rainbows were super-patient (most weren’t). Next time I might use a disposable barbecue or mini-marshmallows instead. Then the Rainbows got into groups (with an adult to help) and made tents with chairs, sheets and blankets. I got some lovely photos of them hanging out in their dens. Some Rainbows found them so comfortable they almost went to sleep! We had time for a few “campfire” songs, then it was time to strike camp for the day. If only real camp was so easy to clear up! This entry was posted in Rainbow meetings and tagged camp, fire, food, meeting plans, outdoors, rainbows on November 4, 2016 by Clare. Let’s flash back to last summer, when my Division combined a parents’ meeting for camp with a night hike. We met in the village hall we normally use for our night hikes (because it works very well). First we had a meeting for the Guides and Senior Section coming on camp a few weeks later and their parents. It was a camp for a whole county, with a subcamp for each Division. The subcamp leader (and others where relevant) went through the usual sort of things: arrangements for sleeping, food, first aid, activities, kit required, etc etc. Afterwards, parents had the chance to speak to individual leaders, and the girls told a leader who they did/did not want to share a tent with. She wrote this down discreetly, of course! But it’s better to know this outright, rather than accidentally put together girls who really don’t want to share a confined space for a week. After that, everyone left except leaders and girls who were going on the night hike, and other girls arrived who were hiking but not coming on camp. We originally meant it to be a chance for the girls on our subcamp to get to know each other, but only about 1/3 of them came, mostly from 2 or 3 units, so we opened it up to everyone. Have I ever mentioned that I love a night hike? Oh yes, last year. Well, I do. I love walking in the dark (as long as I know where I’m going), letting my mind and my senses open up, and showing the girls that they needn’t be afraid of being out in the dark. It followed the same format as always. We set off from the village hall around 9:30pm, walked through the village, up a hill, along a ridge, admired the view, did a Promise ceremony, walked down a hill, through the village, and got back to the hall around midnight. The only thing different this year was the weather. It was moist and foggy so there wasn’t actually much view to admire, but we were lucky it wasn’t raining, as it had been for most of the day. Back at the hall we enjoyed some lovely hot chocolate made by a leader who’d stayed there. The girls put their beds down, got into pyjamas, and settled down for chatter, games and nibbles. The leaders put out chairs and also settled down for chatter and nibbles. After an hour or two some of the girls (and adults) dropped off to sleep naturally, and we started shushing and settling the rest. I slept from about 2:00-6:30, which is better than some years! In the morning we had cereal and toast for breakfast and the girls were collected at 8am. Another good night hike in the tried and tested way! This entry was posted in Camps and holidays, Guide meetings and tagged camp, division, guides, joint meetings, meetings, outdoors, parents, residential, sleepover, walking on December 23, 2015 by Clare. My Guides started the summer term with a picnic for all the division at a local beauty spot. The motivation was that we were passing on the county camp baton to the next division. It was like a relay in the run up to camp: the baton was passed round every division in the county, so the girls could see it and get thinking about camp. It visited my Guide unit before Easter. We wanted the handover to include everyone in the division, and all sections, and a “bring your own picnic” evening worked out as the simplest option. We were very lucky with the weather. You never know in April (or at any time of year, really! ), and if it had been cold/raining/cloudy and therefore dark early, it could have been a bit miserable. Instead, it was glorious being up there at sunset. There were probably a couple of hundred girls there, not every unit, but every section and every district was represented. We gathered in a big circle for a welcome, then QGB and I led a game where they had to get into groups and make shapes. For example, “get into a group of 10 people, where not everyone is the same age, and make a bus”. Then we broke off and had a picnic, then got back together at the end to hand over the baton to some leaders from another division. Did we sing anything? I can’t remember now! I do remember I was glad that lots of my Guides came, including a few brand new ones. And that afterwards, the other Guide leaders and I drove to a village pub and had a nice hot chocolate and planned meetings up to half term. This entry was posted in Camps and holidays, Guide meetings and tagged camp, division, food, games, outdoors, planning on November 27, 2015 by Clare. On our penultimate meeting of term, the Guides decorated little chocolate eggs. We gave them a selection of ready-to-roll marzipan (for a yellow colour), ready-to-roll icing (white, some of which we put food colouring in, and also pre-coloured. This was really popular as it was cartoonishly bright), water icing (again, white and coloured. We didn’t have much because I forgot that I’d said I’d make some up and bring it with me – oops, bad Guider. 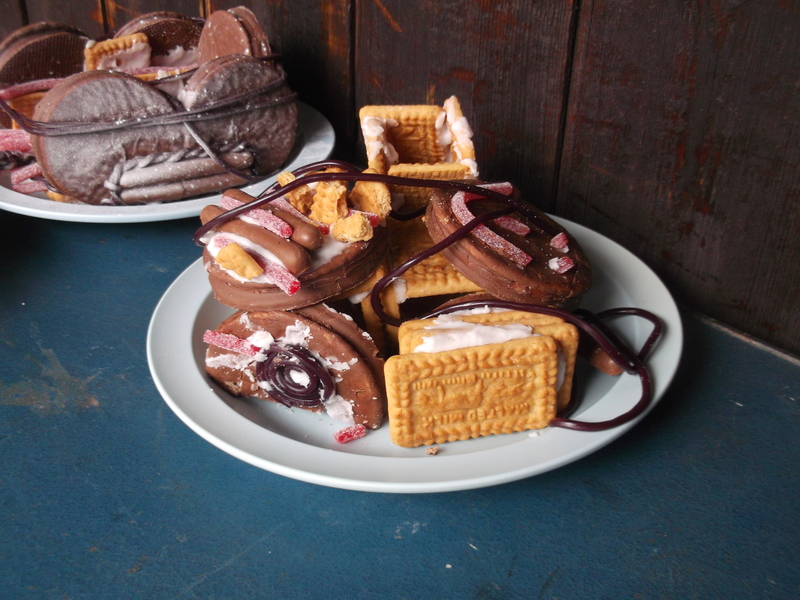 But we did have about half a packet, which was good for cementing the eggs onto biscuit bases), writing icing, and some leftover sweets and marshmallows we had hanging around. In other news, I now have a smartphone (hello, 21st century) with a whizzier camera than my old broken camera, so better pictures should be forthcoming. That kept them entertained for about an hour. For the final part of the evening, we showed the girls a “baton” that is touring every Guide unit in our county in preparation for the county international camp in the summer. We read out a message from the County Commissioner that went with it, about how much she was looking forward to the camp. Those who are going wrote messages about what they hoped to get from it and stuck them inside the baton (it has a screw-top lid and was probably once a hot chocolate powder pot). To give the non-camping Guides something to do, and to get ahead with programme-planning, we also asked them to write down what they’d enjoyed most this term and what they would like to do next term. We had a quick look through afterwards and a lot of the suggestions were our usual summer term activities, so it should be easy to please them! This entry was posted in Camps and holidays, Guide meetings and tagged camp, easter, food, guides, meeting plans on March 30, 2015 by Clare. Thursday morning dawned bright and cool, and I stepped out of my tent to find the five bivouacking Guides sleeping snug and sound. We took them hot drinks to tempt them to leave their cocoon – they all said they’d had the warmest and best night’s sleep they’d had all week, probably because they were covered in so many layers, and maybe also because it’s easier to stay up chatting in a tent than it is outside lying in a line pinned down by groundsheets! The girls in the tipi had also slept well. We joked that we wondered why we bothered with patrol tents at all! Breakfast was one of my favourites, camp dreams, i.e. sandwiches dipped in pancake batter and fried. The fillings were jam and cheese this time, but I’m also partial to chocolate spread – nom! The girls weren’t due to leave until 5:30pm, since it was a weekday and we thought it might not be convenient for some parents to pick them up in the middle of the day. We tried hard not to make the whole day feel like we were just waiting to go home, although it was obviously on everyone’s minds. In the morning, we split the Guides into two groups. Just for a change from the usual activity groups, which they’d been in most of the week, we divided it by age, with the 10-11s together and the 12-14s together. One group finished their hobby horses, because it would be a shame to leave them unfinished, and also because Co-Activity Leader was adamant that she wasn’t going to take any broom handles or foam home! …and this one is being drawn by a horse, whose smiley face has partly fallen off. The groups swapped over, then we had squash and cake. Then First Aider and I took the girls off-site to give the others a leaders a chance to clear up and take the remaining tents down. We went to the campfire circle with pens, post-it notes and the cow-shaped laundry basket, and asked the girls to write their favourite thing about camp on one colour post-it, and something they would change on another colour, and feed them into the cow’s mouth. Next, the Guides did a trail, finding bird pictures hanging in the bushes and writing the birds’ names in a grid. When it was filled in correctly, a line of letters going downwards spelled ORNITHOLOGY. The first, second and third groups to finish got to go up to be served first at lunchtime. I made the trail for region camp last year, and kept the bird pictures and blank answer sheets in the hall – fortunately, I grabbed them at the last minute as a possible filler activity! Then First Aider ran a game – something about being baby birds flying into nests, which continued the bird theme nicely! – while I gathered up the bird pictures and played hide-and-seek with FA’s three-year-old. He soon realised that I was easy to find in the bushes because of my bright purple cardigan! Lunch was a “cattle drive roundup”, i.e. finishing all the leftover food. I forgot to mention that the QMs, when drawing up the menu, gave everything themed names, like “cowgirl casserole” and “Native American hotpot”. As you can tell, I didn’t really keep track of what we were eating when – I knew that it would be tasty, whatever it was – so it became a running joke that whenever someone asked me what was for the next meal, I’d say “cowboy surprise”. After lunch, the Guides did a litter sweep of the site. This was very worthwhile, since as well as finding bits of rubbish – mainly water balloon fragments and the odd sweet wrapper – someone found a figurine that had dropped off QGB’s badge tab and would have been a shame to lose. The Guides made a final trip to the campsite shop, and I went in for the first time all week and stocked up on badges for me and other leaders who had asked for them. 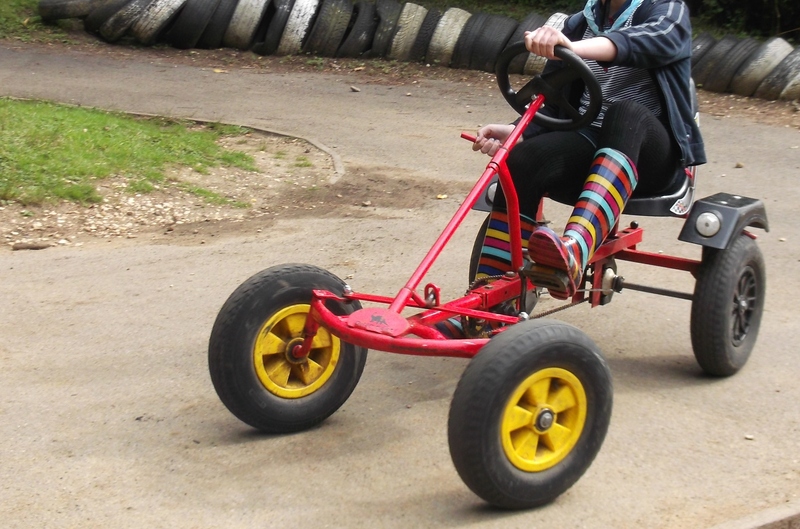 Then we went to our final activity, go-karting. There were just two pedal go-karts and a little track, so we raced in pairs and timed everyone so we could work out the fastest. With 24 girls and a one-hour session, there was only enough time for everyone to have one go, and there was a fair bit of sitting around. We tried to keep everyone involved by counting down to start the race, and having a few Guides doing the timing and a couple on hand to give the karts a push in the uphill part of the track. They were generally happy to watch and talk amongst themselves. The senior section and older Guides were getting a bit uninterested and at first said they didn’t want a go, but the younger ones managed to talk them into it. Oh, and there were a couple of minor collisions that caught everyone’s attention. Despite me making sure everyone knew how to brake before they started, some Guides forgot it when they reached the slightly downhill part of the track…one hit the tyre wall, sending tyres flying spectacularly, and another took a corner too fast and rolled the kart. I’m glad they have a few more years before they can drive cars! Fortunately both were ok – I don’t want damaged Guides at any time, but especially not an hour before the end of camp, and especially not QGB’s licence camp! I had a go too (soundly trouncing Co-Activity Leader), and to be fair, it was quite hard to remember to pull the brake handle in the heat of the moment. When our time was up, we went back to our campsite – now looking very bare – and got everyone in a circle for a final piece of cake (the QMs had paced it very well, so we just about got through it all) and a closing talk. QGB gave out camper interest badges and the badges we had made, announced some prize winners, and thanked everyone; and we thanked her and gave her three cheers for doing such a spectacular job of running the show. That brought us to the end. The girls collected their belongings (including hobby horses), and found their parents. The leaders took down the tipi and packed the last bits and bobs into vehicles. We said our goodbyes – not too sentimentally, as we all see each other quite often – and headed off. Those who live near our hall and camp store kindly returned equipment there. QGB and I were the last to leave the site, and she dropped me off at home to an evening of unpacking, washing, and a very early night. Real world rehab could wait till the next day. There’s so much about camp that I haven’t included, because I forgot it, or forgot when it happened, or it would sound ridiculous if I tried to write it out, but I’m glad I’ve at least written the main things. That was the point of this blog, really: to record what I do in guiding, so in future I can look back and remember it, because so much gets forgotten or blurred together. I’ve enjoyed all the camps I’ve been on, but I do think this was one of the best, for a mixture of factors but especially the lovely people in my guiding family who I was lucky enough to share it with. This entry was posted in Camps and holidays and tagged camp, food, go karting, guides, outdoors on September 22, 2014 by Clare.